My local farmers market is really starting to pick up. Mindful of the excessive amount of kale still in my fridge, I limited myself to radishes, scallions, turnips, carrots and thyme. (More on those last three later.) Having hit the gym on the way home, I wanted a quick but virtuous lunch. I started with half of a whole wheat flatbread. I am a big fan of these because they keep in the refrigerator pretty much forever and can be dolled up an infinite number of ways. I heated up my cast iron skillet and toasted the bread on both sides before applying a layer of ricotta cheese, which is a great source of quick protein that also keeps in the fridge. I added a layer of thinly sliced radishes. In a moment of inspiration, I decided to use the already-hot skillet to grill strips of scallion in a teaspoon or so of olive oil. Freshly ground pepper, fleur de sel and a light drizzle of truffle oil topped my springtime tartine. It was fresh but lush, and it screamed out for a crisp white wine. Lo and behold, there was an open bottle of Gruner Veltliner on the top shelf of the refrigerator. OK, maybe lunch wasn’t all that virtuous. 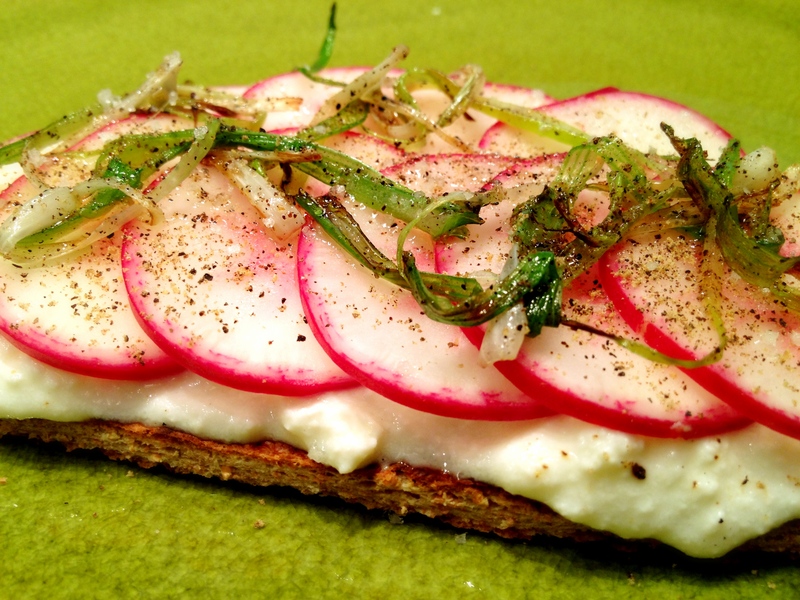 This entry was posted in quick lunch, vegetarian and tagged flatbread, radishes, ricotta, scallions by Jasmine Nielsen. Bookmark the permalink.